Perhaps that’s a bit trite but our move here certainly wasn’t particularly well considered or well researched. It was really just one of those ideas that we had vaguely discussed for many years. It wasn’t that we weren’t quite happy where we were in Dorset; in fact, we were incredibly content but we just felt that we were perhaps slipping too easily into a comfort zone from which we would never dare move. We had a comfortable, middle-class lifestyle, good friends and beautiful rolling countryside all around us. Our neighbour was Hugh Fearnley-Whittingstall who had just installed himself in River Cottage and was about to launch his television career on the back of living the good life, the life we were already living. So what possessed us to give it all up? Maybe we just felt that it was all too narrow, all too predictable. Suddenly we could see the next 20 years mapped ahead of us. Discussion about “which school” had been going on at dinner parties since the children had been in nappies and the house-price discussion was part of every conversation. It wasn’t that we wanted to escape, nor that we wanted something more, rather that we wanted to challenge ourselves, get out of that comfort zone and feel alive again. We were lucky: our children were still young enough to adapt to pretty much anything we could throw at them and we both had jobs that we could continue from anywhere in Europe. I would like to say that we then did copious research before we decided where in France to stick our pin – but I would be lying. We actually put our house on the market, accepted an offer, put most of our belongings in storage, packed two cars with our suitcases, the children and our long-suffering black Labrador and headed off in convoy to the ferry for a new life in France. That was nine years ago and we are still here in our beautiful, hidden corner of South West France, the Ariège, where only the most intrepid fellow Brits dare tread. Well, I might be exaggerating somewhat, but it certainly feels like La France profonde here, tucked away, hidden and unspoilt, with open mountain valleys, rivers and soaring mountain peaks as our daily backdrop and not too many Brits taking The Telegraph with their morning crème. In the respect that we are living a country lifestyle, our life here is not that different from Dorset but the fact that we are doing it all in another language and culture makes every day an interesting challenge that makes us feel alive again. There are no discussions about house prices and school fees here; it is rare for anyone to even ask us about work. The stereotype of good living and emphasis on food is right – people here are more interested in how you are going to cook your mushrooms for your supper and what wine you will choose to go with them. But the French also love debate. Discussions about the important issues of the day and on all levels of politics are the norm – everyone has an opinion and there is definitely a feeling that people want and expect to be involved in the running of their community and country. And that for us is one of the many reasons we love living here. Our French friends and neighbours have different backgrounds and different ideas but what is also very evident to us is that people here have their priorities right. I believe the quality of life here is better in general than in the UK; the schools, the health care, the food and wine and the community spirit are all fantastic. There is practically no crime (except terrible driving); our children are bilingual; and then there’s the climate. We spend most of our time outdoors, we cycle along the valleys, swim in the clear rivers and have easy access to the mountains for walking and skiing. We shop for fantastic fresh produce in markets, eat outside half the year, and we are surrounded by fabulous views. Of course not everyone can just up sticks and move to France; we know that we are lucky. My husband is a pilot and commutes to Heathrow and I have for many years worked freelance in marketing and PR and as a copywriter. 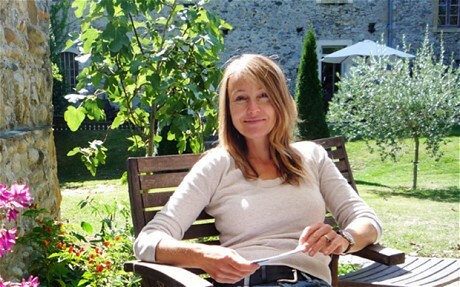 Three years ago I set up my own fully registered property-finding company here in France so that I can combine my professional skills with my personal experience of finding and renovating old properties and living and working abroad to help others make the move. I work for private clients, with the aim of finding them their dream home but, unlike many similar property search agents in the UK, I work with all budgets from €30,000 upwards. Agents here are really behind the times; many don’t have websites and those who do rarely update them. French estate agents also work differently from English estate agents and are not interested in taking your details to tell you of suitable properties as they come on the market. They expect you to visit them and then will show you what they have available on their books at that time: a very frustrating and time-consuming business. Here the agent’s details contain only the most basic facts, so it is impossible to tell what a house is really like – let alone whether it’s near a noisy road, dog kennels or rubbish dump. So I do all the time-consuming initial trawling thorough property details, then visit all possibilities before drawing up a short list of houses that meet my clients’ needs exactly, complete with photographs and in-depth description so that they do not waste time and money viewing unsuitable properties. Of course there are things that I miss about living in England and there are aspects of living in France that drive me mad (yes, the paperwork thing is true) but it has been a fantastic experience and I would encourage anyone to try living in another country and culture if just for a short time. If there is one thing we have given to our children (now numbering four!) by bringing them out here, it is freedom and space to be who they want to be as well as tolerance, self-confidence and adaptability to take whatever life throws at them and do something with it. Nadia’s company is at foothillsoffrance.com. This article was originally published in the Telegraph Weekly World Edition.